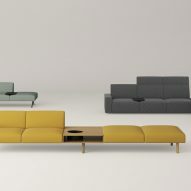 Dezeen promotion: design brand Coalesse has launched a customisable lounge system by Spanish company Viccarbe in North America, offering an expanded range of options. Coalesse is now producing the Sistema Lounge System, which was previously only available from the Viccarbe Imports Collection, for the North American market. 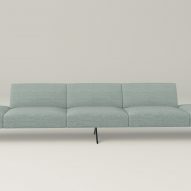 The modular seating range, designed by Viccarbe with Spanish studio Lievore Altherr Molina, can be customised in a multitude of ways – from backrest height to base options. 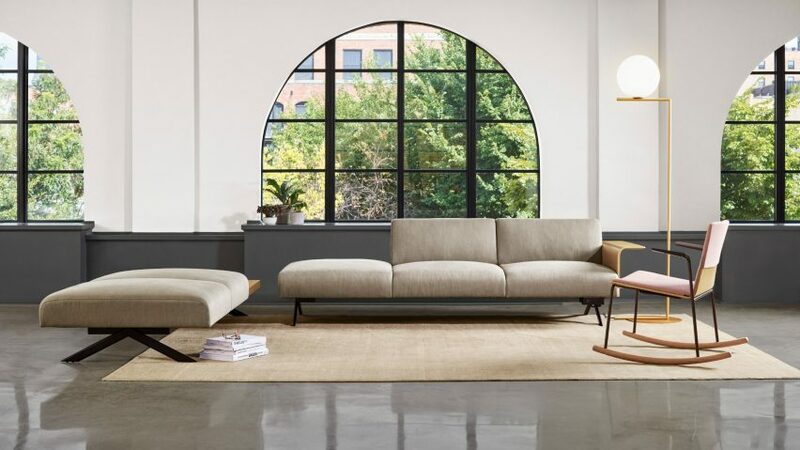 "Through Coalesse, Sistema is now open to even greater self-expression as customers can personalise every standard element in the system — by applying individual palettes of colour, fabrics, woods and other detailing," said a statement from the Michigan-based company. The Sistema system is based around an upholstered square seat module, which can extend all the way to the ground, or be supported by a variety of base options, including metal and wood. Coalesse will offer the metal cylinder and scissor-style legs in any colour from its range, and a wider offering of pre-approved textiles than was previously available – including customers' own fabric. 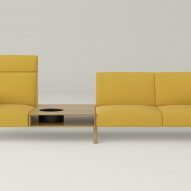 The Sistema components connect together to create endless linear runs or L-shaped configurations using the freestanding ottoman with upholstered base lounge. Seats can be swapped for tables or power can be added to the leg base lounge, and armrests placed on the ends and between the modules. Three backrest heights are available, along with the option for backless benches, so the system can be configured to suit any workplace. 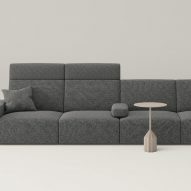 "With Sistema, one can build anything from a classic, high-backed sofa to a sleek, armless bench, a social sectional in any length to a quiet niche for one or two," said the statement. Coalesse, part of the Steelcase group, recently relocated its design studio from San Francisco to Munich, with the aim to boost its international reach. For more information about the brand and its range of products, including the Sistema Lounge System, visit the Coalesse website.